Royal Enfield has a fan following that never seems to shrink, no matter what motorcycles come out of the Chennai stables. But despite their love for the brand and refusal to ride anything else, it was about time the Bulleteers got something that could be taken seriously in terms of performance and reliability, apart from the 'lifestyle motorcycle' image the RE has developed over the years. Tasty news bits about a new and efficient 500cc engine based on the AVL 350 engine had been floating around, and the new motorcycle had been available in international markets for quite some time now. Rumours of an India launch did not help the case of the exasperated Indian Enfield community. The wait finally ends and the bike is here, and as they say, better late than never. 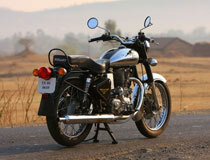 Could this be the motorcycle that brings Royal Enfield on equal footing with other bike makers in terms of technology? We find out. 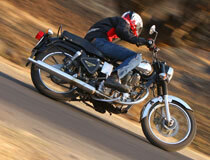 No radical redesigns, even if the 500 LB promises to be a radical motorcycle from Royal Enfield. Almost the entire Machismo 350 trim has been retained, with its heavy chrome look dominating visuals. Bling and shine sees ample coverage throughout the length of the bike, finding mention not only in the ample tank but also in small bits like the front fender and the chain cover. The overall look of the bike is appealing, but an Enfield purist will miss the subtle and luscious curves of the tank which seem to get lost in a chrome overdose. Fork gators instead of cast cladding, and a narrow front fender impart a lean look to the front end, which works well with the rest of the bike design. The long exhaust extends beyond the rear, making for a nice streak of chrome in profile. The Leanburn block, however, is somewhat of an eyesore since its matte silver finish fails to gel with the overall design theme of the bike. 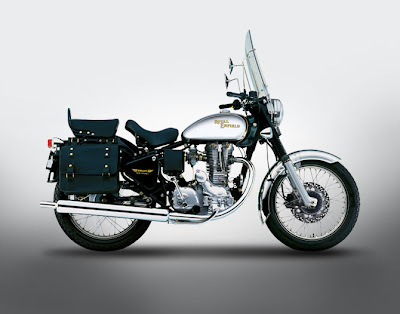 The Machismo was the most modern RE design that retained the traditional lines of a classic British motorcycle. Choosing the trim for a bike that RE wishes to project as retro-modern is a smart move, and even though the Machismo 350 has now been discontinued, the choice to make an all-new bike look almost identical to an all-old motorcycle might disappoint some. The 499cc OHV single on the 500LB is way more rev-happy than its cast iron predecessors - great news for the motorcycle enthusiasts, but not so great for thump-lovers. The easier revs can be attributed to some serious work that has gone into the engine from Austrian developers AVL, including lighter and stronger pushrods and a reworked valvetrain. Breathing in through a Mikuni BS29 CV carburettor, the engine also comes with new modifications like repositioned valves, a compacter combustion chamber and a more centrally placed spark plug for better burning. A modern day TCI ignition manages spark generation. 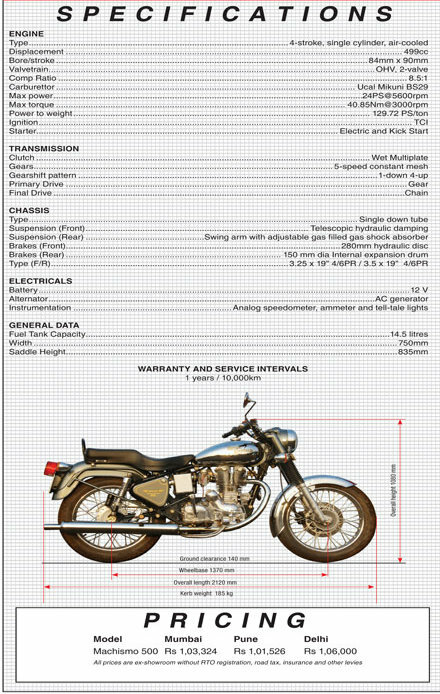 The 90mm of stroke as opposed to the 86mm bore, the dimensions are much squarer than on other Enfield thumpers, and the power output figures show the difference. Peak power of 23 horses now comes in at 5600rpm, significantly higher than the old cast-iron unit. Peak torque pegs at a healthy 40.85Nm, in true thumper tradition. 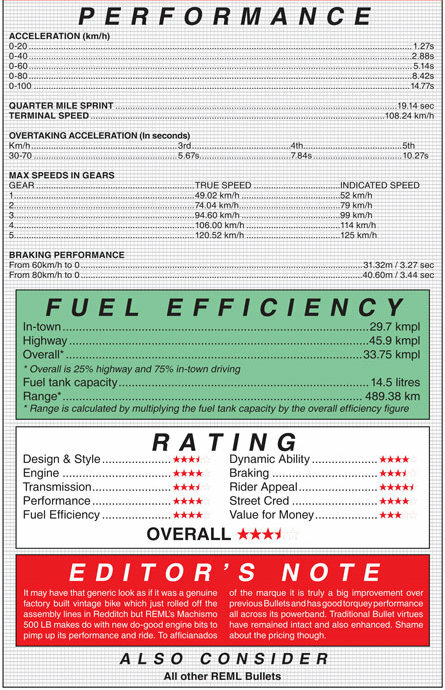 The more conventional five-speed left-shift gearbox finds favour over the traditional British right-shifter, and brings the bike up to the mark in terms of the transmission as well. The tubular frame uses that hulk of an engine as a stressed member, which is makes good engineering sense. Telescopic forks on the front and a 5-step adjustable gas-filled shock absorber at the rear take care of the suspension duties. With a wheelbase of 1370mm, straight line stability can be assumed, but only a ride will tell how well the bike handles at pace. Is this a retro-single at all? Dreaded Bullet back-kicks have been easily sorted out by the presence of an electric starter on the 500LB. Thumb the starter, and the engine cranks over a couple of times before thrumming to life, minus the patent Bullet thump owing to the mild sounding company fitted exhaust. Some revving in neutral itself makes the difference in characteristics of the new AVL engine over the cast-iron ones. The smooth revs make the 500LB feel and sound like a much more contemporary single cylinder motorcycle, as compared to the old Bullets that seemed to operate in a league of their own. Generous masses of torque are always at tap, and small twists of the throttle are enough to send the 500LB leaping forward with eagerness if in the right gear. Well spaced gear ratios on the 5-speeder and all that pulling power mean that the bike gobbles up a quarter mile in about 19 seconds from standstill - a figure at par with most modern Indian performance motorcycles. For the leaps in the engine performance over its previous models alone, RE deserves appreciation for the Leanburn powerplant. Our test bike did seem set up for a highway stint rather than an offroad excursion, which is why the stiff suspension worked wonderfully on well-paved mountain twisties but did seem somewhat compromised on potholed city roads. For a bike its weight though, the Machismo does manage to impress with its handling. Flicking it through switchbacks is easier than one would imagine, and the well sorted out rake and trail help in keeping in the bike agile despite its spaced-out wheelbase. 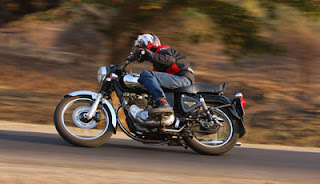 The suspension setup aids the engine very well while exiting corners, and even though the Enfield frames have been notorious for their flex under braking and cornering, the 500LB does not take any confidence away during spirited riding. The 280mm front disc brake works impressively while stopping the weighty bike, and the MRF rubbers support well without letting out dramatic squeals under heavy braking. Internationally, RE markets is bikes as lifestyle retro motorcycles, but given its touring image in India, ride quality and comfort are important issues that must be considered. Although vibration damping is significantly improved as compared to earlier RE models, it might still feel a little too buzzy for riders used to more refined Japanese machines. The stiff suspension on the test bike also compromised pillion comfort to a degree. The cushy seat does its limited bit to balance out the jittery ride quality during a long haul over poor roads. The Machismo 500LB costs Rs 1,10,000 on-road in Pune. That makes it the most expensive Indian motorcycle in the market. Mileage on the Leanburn powerplant, however, adds cheer. Our test bike returned a fuel mileage of 44 kmpl on the highways and 38 kmpl in the city. With a 500cc displacement, that is quite heartening. Better fit and finish also speaks of higher quality standards on RE's part, and maintenance costs should be significantly lower than on other Enfields. Ride quality is an issue that can easily be sorted out with a few clicks on the rear springs. Living with the 500LB should not be too much of an issue, especially with the 'royal' feeling riders can expect riding the bike through the city. Past city limits, the 500LB is on home ground, be it the highway or the mountains - we'd suggest you spend most of your ride time in this area for maximum fun and satisfaction. With the most technologically advanced motorcycle in India available for about Rs 20,000 cheaper, cost comparisons with the rest of the market don't favour the bike much. But then, thanks to the whole "Bullet" image, the 500LB only has its own smaller siblings to beat - and in those terms it offers great value for performance. Also noteworthy is the fact that this is about one third the UK retail price of the same motorcycle. 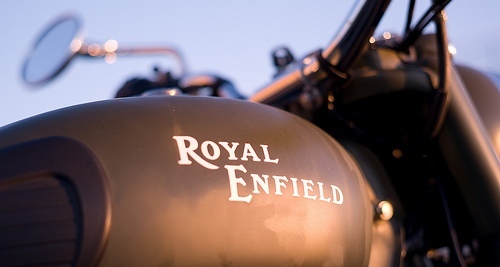 Royal Enfield seems to have its eyes set on making the most out of its niche image, even it means low volumes. After all, the only option for an Enfield is another Enfield. The 500LB is, nevertheless, one of the most exciting motorcycles to come out of the Royal Enfield stables in recent times. The manner in which it manages to stay true to its retro roots and still upgrade itself in terms of technology and performance is commendable. Modern day reliability and performance figures with the old school charm of a British classic - that, we think, promises to take the Machismo 500LB far. Rs 1.05 lakh for the Royal Enfield Machismo 500? It's over-priced by... let's see... Rs 1.05 lakh? 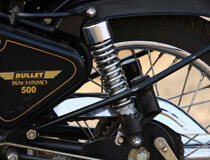 Yes, the Bullet 500 is definitely over-priced by Rs 1.05 lakh. Which makes it a bit expensive. Guys, i am planning to buy a used mach 350 2005 model, leftside gear. As i would be new with mach 350, please quote some advices regarding mach 350. i am very eager for the same as i am new and have less experience with machismo. hws the engine, gearbox and stuff, riding?? Hi, I own a Machismo 500CC and have driven for over 30,000 kms during the last 4 years. I want to change the silencer on the bike. Could you suggest which is the best one for Machismo 500 cc.